Mom's Musings: Disney Treasure Buddies with Giveaway!! Disney Treasure Buddies with Giveaway!! I don't know about your family, but I know that MY family absolutely LOVES the Buddies series of movies. We have been watching them, right from Air Bud, to Space Buddies and all the others. I think secretly my kids would love to have a talking dog who can play sports and go into space!! 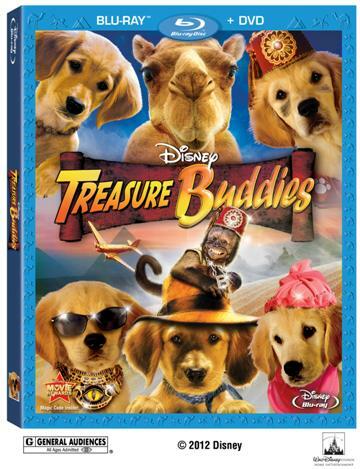 Well, the new Treasure Buddies movie is heading to stores on January 31st and I know that my kids will be bugging me to see it. Disney’s talking canine superstars are back in “Treasure Buddies,” their 6th all-new adventure. This latest story is told from the perspective of the Buddies’ newest friend, a mischievous Egyptian monkey named Babi. As Babi tells us, more than 40 years ago a young archeologist named Thomas Howard, travelled to Egypt with his dog Digger to search for the lost necklace of Cleocatra. They managed to discover half of an artifact, the Bronze of Bastet, but their find triggered a booby-trapped cave-in, which they barely escaped. Forty years later, Thomas is living in Fernfield where he manages a museum. Digger’s grandpups, Rosebud, B-Dawg, Budderball, Buddha and Mudbud also live in Fernfield and, in fact, Mudbud belongs to Thomas’ grandson, Pete. Thomas is about to close his museum due to lack of funding when he gets a visit from a mysterious stranger, Dr. Philip Wellington, who reveals the other half of the Bronze of Bastet and invites Thomas and Pete to accompany him back to Egypt to resume the quest for the legendary Cat’s Eye Jewel. Pete offers to bring Mudbud along but Wellington refuses as he travels with Ubasti, a hairless cat who is allergic to dogs. When Mudbud learns that Ubasti plans to steal the necklace for herself and use its power to dominate both dogs and humans, he rallies the other Buddies to stow away on the private plane in order to overtake the expedition and thwart Ubasti’s plan. Once they get to Egypt, danger lurks around every secret sphinx, cryptic crypt and puzzling pyramid. With help from lovable new friends including Cammy, a baby camel and the clever Babi, the Buddies avoid booby traps, solve puzzles and explore a mysterious tomb in their most exciting and challenging adventure yet. “Treasure Buddies” stars Ty Panitz (“Spooky Buddies,” “How to Eat Fried Worms”), G. Hannelius (“Space Buddies,” “Snow Buddies”), Skyler Gisondo (“Santa Buddies,” “Spooky Buddies”), Tucker Albrizzi (“Spooky Buddies,” “Bridesmaids”), Charles Henry Wyson (“The Curious Case of Benjamin Button”), Richard Riehle (“The Search for Santa Paws”), Edward Herrmann (TV’s “Gilmore Girls”), Mason Cook (“Spy Kids: All the Time in the World”), Adam Alexi-Malle (“Hidalgo”), Mo Gallini (TV’s “24”), Christopher Maleki (TV’s “Passions”), Maulik Pancholy (TV’s “30 Rock”), Ryan Stiles (TV’s “Two and a Half Men”), Tim Conway (TV’s “Spongebob Squarepants”), Elaine Hendrix (“The Parent Trap”), Kaitlyn Maher (“The Search for Santa Paws”) and Aiden Gemme. Directed by Robert Vince, written and produced by Vince and Anna McRoberts. Original music is by Brahm Wenger (“The Search for Santa Paws”) and Animal Coordinator is Mark Forbes (“Zoo Keeper”). I have 3 TREASURE BUDDIES Blu-Ray Combo Packs to giveaway on my blog!!! Follow Mom's Musings on Twitter and copy this tweet "3 winners #WIN a Treasure Buddies BluRay Combo pack @momsmusings http://bit.ly/wx7qe5 #giveaway ends Feb 3/11:59pm EST"
Disclaimer: I was contacted to host this giveaway on my blog. All opinions are my own. Thank you for posting your review of Treasure Buddies. My family has also been a fan of this series since Air Bud. My 3.5 yr. old daughter would love to watch this newest Buddies movie. The only other Buddies movie we've seen is the Spooky Buddies so I think that is our current favorite. Our favorite buddy is Rosebud. I like Walt Disney on facebook. we've never seen any of the movies- but my son would love it. I would watch this with my son! I would like to see it the most! My favorite Buddy is Rosebud. My boys would love to see this movie the most they love puppies and love the other buddie movies as well. my favorite buddie movie was santa buddies!! My favourite Buddy is B-dawg! I Follow Moms Musings on twitter and tweeted! I should say my DS6 would love this movie most, but it's a bit of a toss up with me :) I think these movies are really cute. My daughter would love this movie. Treasure Buddies is our favourite by far. 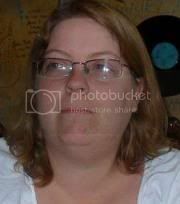 I am a single mom of 5, ranging in age from 6-18, I write about life, living with a special needs child, and I do reviews and giveaways. I hope you enjoy your visit!